Born before recorded history and a veteran of a thousand wars, Gilad Anni-Padda is the Fist and Steel of the Earth. The immortal champion of the Geomancers, an unbroken line of the mystics’ guided by the voice of the Earth, the Eternal Warrior wages a never-ending war against evil. VALIANT (yeah, yeah, all caps) eventually collapsed in the usual round of sordid corporate backstabbing, drama and betrayals. Much later it would get resurrected, but this profile concentrate of the material of the 1990s. Namely the Eternal Warrior, as aptly introduced by the blurb above. Other Aliases: Gilad Abrams, Gilad the One, “Fist and Steel”, Gil Masters, Gilad Anderson, Gil Masters, Gillie Patcher. Known Relatives: Aram the Other (Brother), Ivar The Timewalker (Brother), Kalam (Son, deceased), Vandal (Father, deceased), Triahna (Mother, deceased). Height: 5’11” Weight: 320 lbs. Gilad possesses supernatural strength which enables him to lift (press) approximately one ton directly overhead. 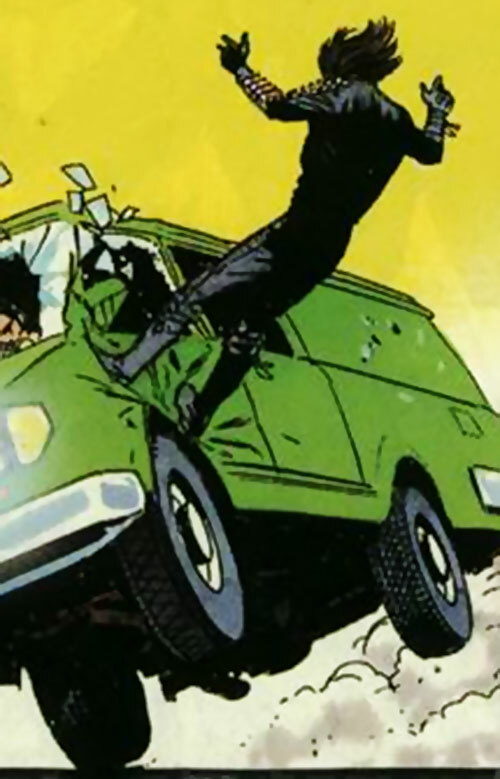 In the past, he has demonstrated sufficient physical strength to wrench a car door directly off its frame, and to punch through solid steel with minor effort. Like his brothers, Gilad Anni-Padda does not age, and possesses supernatural stamina. While he can be wounded in battle, he cannot be killed through conventional methods and heals at a rapid rate. Presumably, only decapitation could permanently kill Gilad. Over the centuries, Gilad has developed many skills. He is a deadly melee combatant and possesses expertise in the use of most melee weapons and fire-arms designed by man. He also has great military knowledge and is capable of commanding troops and leading men both on and off the battle field. Finally, Gilad is skilled actor and spy, as well as a competent lock-pick and thief. Gilad tends to acquire weapons as he needs them on adventures, but usually favours handguns and/or melee weapons. He has a particular affection for a unique spiked gauntlet that is modelled on the very first weapon he wielded as a child. Gilad Anni-Pada was born in 3268 BC among warlike tribes roaming Eastern Europe. Scarce resources meant a never-ending search for areas with good hunting and water. The nomads kept moving on as these became depleted. As a youth, Gilad fought side by side with the men in his tribe. At the age of 11, he was twice as strong as a full grown man and could outfight any of his fellow tribesmates. He first distinguished himself in Anatolia (which is also known as Asia Minor), in the year 3257 BC, when he faced a giant man from an opposing tribe. Though his foe was armed with a huge axe and spear, Gilad easily defeated and killed him with nothing more than a lion’s paw which he wore as a barbed glove over his right hand. From that point he was given the name “Gilad the One” by his people. He soon thereafter became the battle leader of his tribe. By the time Gilad reached physical maturity, he was taller and stronger than anyone (or thing) he encountered, save his younger brother Aram. In addition, the two men had stopped aging when they had reached their 30th year. Vandal, who was not only the leader of the tribe but was also Gilad’s father, chose Gilad as his successor when he had grown aged. The choice was a simple one for Vandal. From the time he was a child, it was clear that Aram was too soft-hearted to lead his people in the harsh world they lived in. Gilad took the responsibility seriously. He managed to keep his people alive until they reached Mesopotamia . Their numbers had grown to the point where they could no longer survive through mere scrounging. Gilad himself had taken a wife, Janna, who had bore him several sons. The youngest was named Kalam. With his people’s fate in his hands, Gilad decided to raid a nearby walled city. Ten days prior to the raid, a dark-skinned man wandered into Gilad’s encampment. He called himself a Geomancer – a shaman. He warned Gilad that his fate was greater than that of his people. Gilad scoffed at his words, but curiosity overwhelmed him. He asked the strange dark man whether or not the raid would be successful. The Geomancer gave him a thinly veiled warning that copper swords bite deep, which Gilad promptly ignored. The raid went extremely poorly for Gilad’s people. The walls of the city kept them at bay, while the Mesopotamian’s cruel arrows rained death down upon Gilad’s hunters. Gilad’s forces fled from the walled city in defeat. But the vengeful Mesopotamians pursued them all the way back to their encampment and slaughtered them to the man. Gilad and Aram were the sole survivors of the battle. In the end, they had fought back to back as they watched their wives, children and people slaughtered around them. Gilad, wanting nothing less than vengeance, tried to persuade Aram to help him gather more men for a counter-strike against the Mesopotamians. Aram quietly refused Gilad’s request. Instead, he decided that he would bury his dead and move on to someplace else were he could start over. Gilad spent the next day burying his people. When night had fallen, he found himself in the presence of the Geomancer once more. 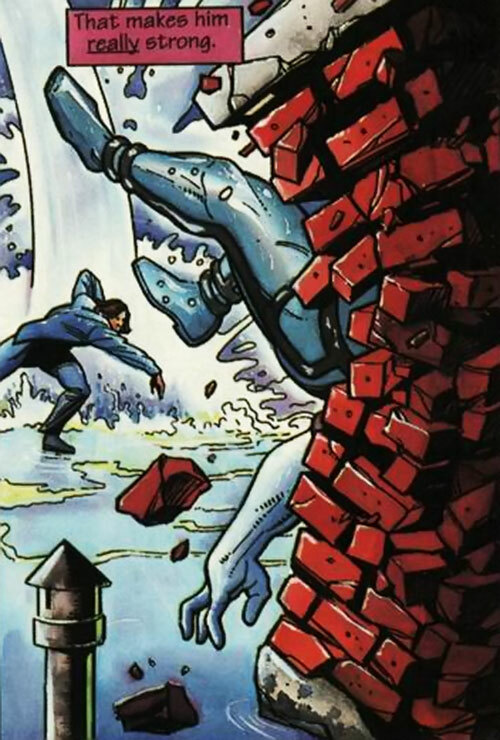 Gilad nearly killed the dark man in a fit of anger, but was stopped in his tracks when the Geomancer revealed that Kalam had survived the assault. Seeing that he had Gilad’s attention, the Geomancer revealed that Kalam’s ultimate fate was to be raised by one of the city’s noblemen. He added that his sons would one day become great kings. Puzzled, yet intrigued, by the Geomancer’s words Gilad decided to leave Kalam to his fate and to follow the Geomancer eastward on his travels. Gilad spent the next 600 years serving the Geomancers as their “Hand and Steel.” The fires of true belief were stoked in his heart as he witnessed all of their predictions come to fruition. The least of these was Kalam’s sons achieving greatness as the kings Gilgamesh and Mis of Ur. When the Geomancers warned him of a battle to end all battles, Gilad knew that his strength alone would be insufficient to achieve victory. Left with few options, Gilad began to search for the one man that he knew was stronger than he was; his brother Aram. He eventually found him living happily in Egypt. Gilad did his best to convince his brother to follow him then. But Aram wouldn’t even consider leaving his new home and family. In the end, Gilad would have to be satisfied that his brother promised that when the final battle had come, that he would be by Gilad’s side to fight it. Gilad then left Aram once more and continued on his travels. From that point forward, Gilad took part in virtually every armed conflict known to mankind. His travels and actions were constantly guided by the Geomancer, who took him to areas of trouble that his undying strength could be of the greatest affect. The Crusades, Feudal Japan, the French revolution, and World War II were examples of the conflicts Gilad took part in. It isn’t clear exactly when Gilad first encountered the entity known as the Immortal (later Eternal) Enemy. But the two faced each other dozens of times over the centuries. Gilad always came out on top, but each victory always cost him dearly. The Immortal Enemy was a bodiless spirit that invaded, corrupted and eventually possessed each and every soul it encountered. The only thing it craved more than the destruction of all of the good in the world, was to possess the very weapon the Geomancers used to stop it time and time again. It wanted to possess Gilad. 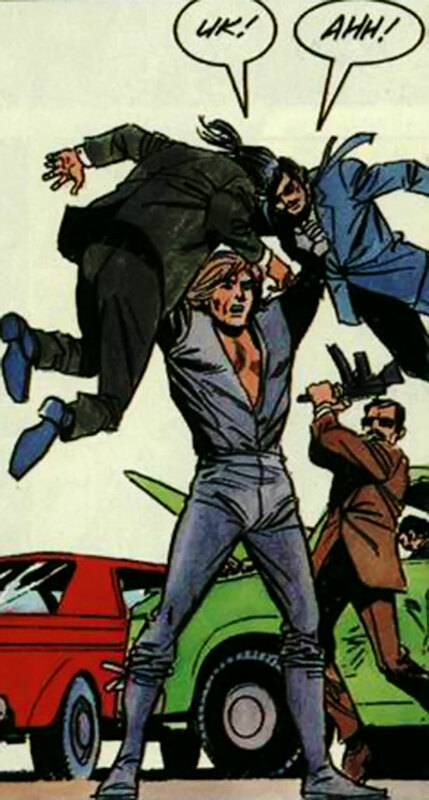 By the time the year 1992 had arrived, Gilad had become an operative of the British Government and mercenary for hire. Neville Alcott (Gilad’s best friend, whose life he had saved during World War II) operated as his handler and contact. 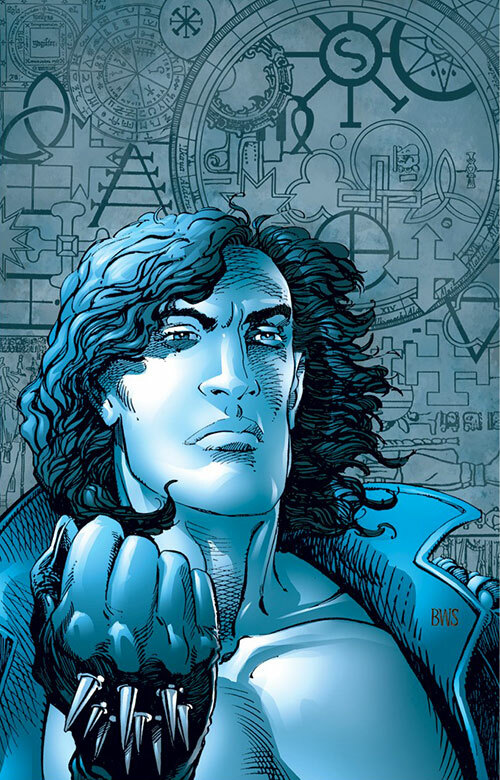 He directed Gilad toward situations that required the immortal’s unique abilities. It was during this time that the immortal Erica Pierce enacted her plan to rewrite all of reality. Erica was a god-like being who had gained her powers during the near nuclear meltdown of the Edgewater Nuclear Power Plant. This also had empowered Phil Seleski aka Solar, Man of the Atom. Erica’s powers allowed her to survive Seleski’s accidental destruction and recreation of the universe, but the process unhinged her. She spent the next 4,000 years seeking a way to repair the damage Solar had done to reality itself. Her persistence eventually paid off. Sometime during the 41st century she discovered a pocket dimension where all of time intersected. It would enable her to enact her plan. Using resources from the 41st century, Erica created a reactor within the so-called Lost Land. It would allow her to literally destroy and rewrite all of reality. Even as Erica set her plans into motion, the Geomancer’s across time responded. They gathered a group of heroes from across all time and sent them into the Lost Land to thwart her efforts. Gilad was recruited by the Geomancer of the 20th century, Geoff McHenry to take part in the battle. Recognizing the upcoming battle as the one he had been forewarned of so many years ago, Gilad retrieved his brother Aram and the two were transported to the Lost Land through Solar’s power. Upon his arrival, he found himself caught up in a pitched battle which culminated on a direct assault on Erica Pierce’s stronghold. And most surprisingly a version of himself from the 41st century. The battle seemed to be going in the heroes favour until Solar fell in battle. With Solar defeated, Erica was able to focus her full attention on the battle. Her power transformed the conflict into a rout, forcing Gilad and his allies to retreat into the forests of the Lost Land. Over the next 157 days, the once united force of heroes splintered into separate factions. 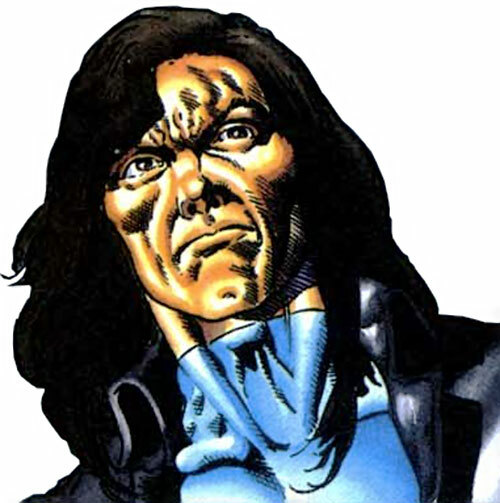 With Solar’s loss, only Aric Dacia (XO-Manowar) possessed enough power to actually threaten Erica’s plans. But soon after his arrival, Aric lost interest in Erica’s plans. He grew content leading his own growing kingdom. Left with little choice, the two Gilads led the remaining heroes in a series of guerilla assaults on Erica’s (who had taken the name Mother God) forces and depots. None of the assaults were meant to halt Mother God’s plans. But they did manage to slow down her progress long enough for his allies to discover a way to free Solar. Once freed, Solar used his awesome might to trap Erica within a black hole. Unfortunately, events had already been set into motion that would eventually cause the Lost Land to collapse upon itself. Before it could happen, Solar used his incredible abilities to send all of the allied heroes and innocents back to their respective time periods. Master Darque (who sought not only immortality but the knowledge and power of the Geomancers). Over the course of his adventures he met and befriended the man called Bloodshot who eventually became one of his closest allies. Both alone, and with allies, Gilad’s actions caused his legend to continue to grow. Gilad eventually disappeared from the face of the Earth sometime shortly before his 7,000th birthday. Not a single trace of information regarding him could be found until Rokland Tate, the Geomancer of the 41st century travelled to the Shasta Island hatcheries. With the spirits of the Earth guiding him, Rokland found Gilad peacefully tending the hatchery. When Rokand approached, Gilad introduced himself as Gillie Patcher. He clearly had no knowledge or memory of his true identity. Rokland tried to convince Gilad of his true identity and his unique destiny, but had little success. He realized that Gilad had been subjected to a form of 41st century brainwashing called psycho-probing. The technique had been used to curb criminal thoughts and actions from that centuries criminal element. With a sudden flash of inspiration, Rokland gave Gilad his axe and asked him if he remembered it. Gilad held the axe for several seconds, and fought the conditioning that made him hate weapons while he struggled to understand the strange young man that spoke to him. To his surprise, the longer he actually held the ancient weapon the more at ease he felt. A few moments more passed, and memories began to flood back into his mind. He remembered wielding other axes, clubs, blades, guns and even his own fists into battle. In that moment, Gilad shattered the conditioning’s hold on his mind. He reclaimed his memories. Enraged and thirsting for battle, Gilad prepared to wage war on the North Am government that had subjected him to their brainwashing, but Rokland stopped him cold. He told Gilad that the reason he had awoken him from his stupor was to take part in the war to end all wars, against Mother God in a land outside of time. Though his memories of the war were hazy and still somewhat fragmented, Gilad remembered enough to realize that he was needed in the Lost Land. He agreed to go with Rokland. Gilad soon enough found himself before a cave that served as the entrance to the land outside of time. 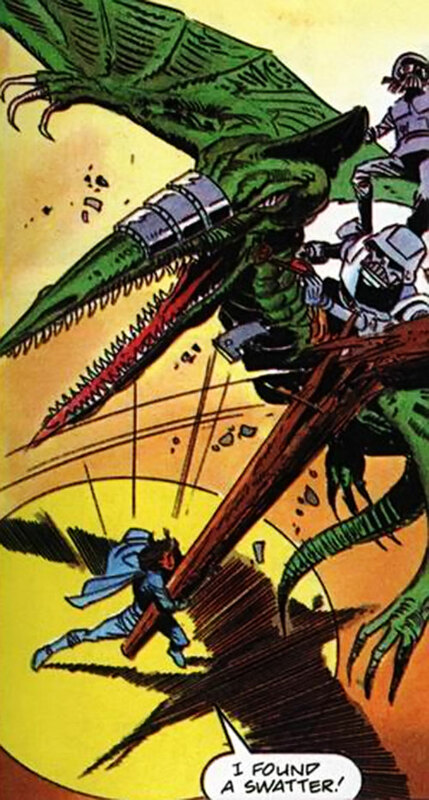 Joining him were the hero Magnus, Robot Fighter and Rai, the Guardian of Japan. The three heroes entered the cave, and after destroying the barrier that blocked the passage, entered the war to end all wars, bringing Gilad’s life full circle. Gilad Anni-Padda is a tall, well muscled Caucasian man with distinctive European features. His shoulder-length hair is a deep chestnut brown as are his eyes. While some may mark him as handsome, Gilad’s relative severe disposition and at times dour expression can make him seem less so. Gilad’s skin has a natural olive complexion, and in most images he is depicted as ageless. However, in other images, he appears to be middle-aged. More than likely, this is that specific artists interpretation of Gilad’s appearance. It has been stated clearly though, that when Gilad (and Aram) were in their 40s that they appeared to be half their age, which would make Gilad look like a young man in his 20s. Gilad can normally be found wearing a pair of dark grey jeans, thick combat boots and his patented leather jacket. He has had the jacket since world war two and presumably it was restored many times. The jacket is also greyish black in colour and it has spent bullet casings running up and down its left arm. When expecting trouble, Gilad wears a bluish grey spiked leather glove over his right hand. The glove is clearly reinforced, and capable of causing havoc on any of those it strikes. After the events of Unity, Gilad began to wear a blue body suit that covered him from head to toe. 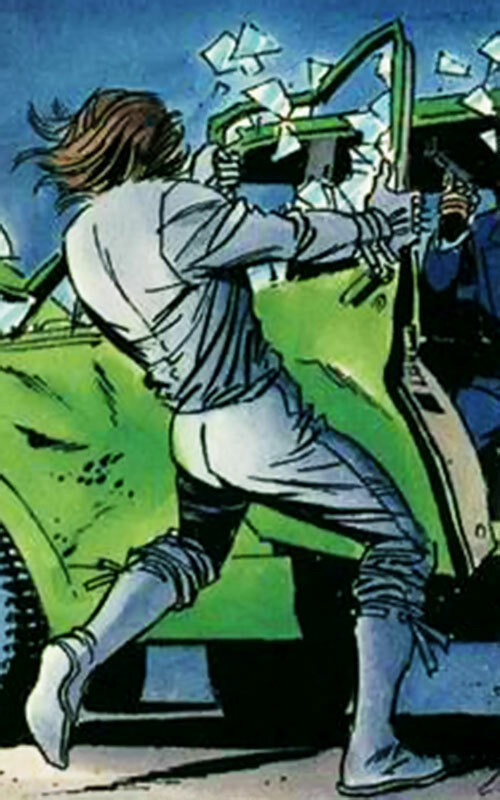 The suit is virtually skin-tight, and has blue gloves that covers his fists. The right glove of the suit is reinforced and spiked in the exact same manner that his original gauntlet was. 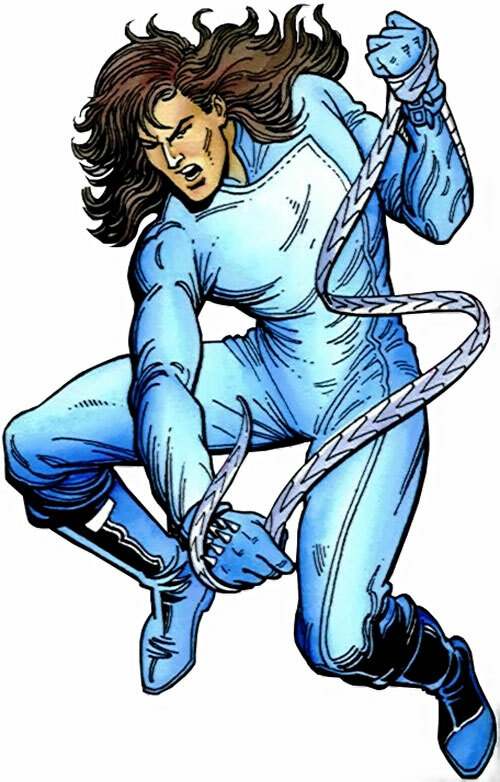 In addition, a long thing metallic chamber runs down the left arm of the suit, and acts as a holster for a long retractible metal whip that Gilad wields in battle. Gilad’s personality has evolved over the many centuries of his life. But at his core he remains the same man. He has a deep abiding desire to make the world better place, and he is willing to make virtually any sacrifice to see his desire become reality. He is willing to fight tirelessly to achieve this goal. Gilad is quite a serious and somewhat humourless man. His every action seems to be driven by his self imposed duty to make the world a better place. He rarely lets down his hair and enjoys the fruits of his labour. This isn’t to say that he doesn’t make friends or enjoy his life. It’s just that he rarely lets his enjoyment show. In this way, his life is in stark contrast with his brother Aram’s, who is anything but serious. Over the centuries nearly all of Gilad’s major activities have been guided by the hand and will of a Geomancer. Gilad trusts their commands and advice implicitly. Under most circumstances he will follow their lead without question. He simply trusts that they know and understand the outcome of his actions and that they have the best of intention at heart. In only one recorded circumstance has Gilad defied the Geomancer’s will. And even in that instance it seems that his defiance was what the Geomancer truly wished in that situation. When left to his own devices, Gilad is currently a soldier and agent for MI-5. He travels to trouble spots around the world and deals with various criminal organizations with surgical precision. Gilad has developed a deep resentment for organized crime and men who abuse their power over the weak in general. He can often be found in conflict with such men. 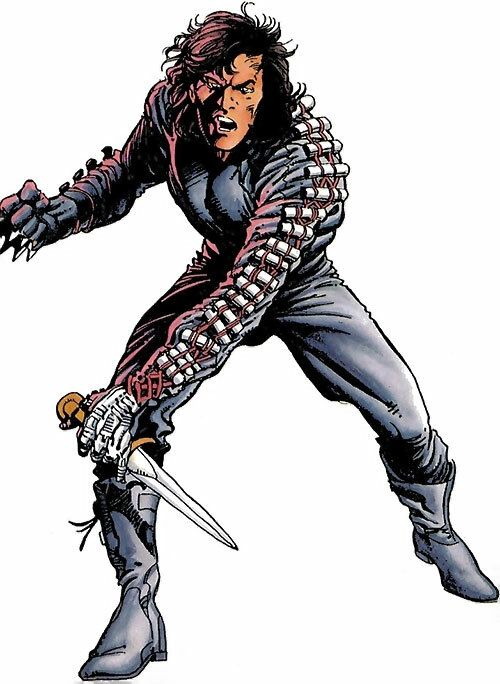 The cleanest way of insert Gilad into the DC Universe is as Vandal Savage’s son. The three Anni-Padda siblings (obviously renamed to Savage siblings) could follow relatively the same path, except that their father would still be alive within the DC Universe. More than likely, the Geomancers would have come into existence in direct opposition to Savage himself. The poetry of them using his own son as a foil against his father’s actions would not be lost on the situation. Density Increase is a Form Function (+1FC), is Always On (-1FC) and is Already factored in (+0FC). Invulnerability does not activate if killed by decapitation (-1FC). Credentials (MI-5 Clearance, High), Language (likely native Indo-Hittite, Pre-Hurrian or Pre-Hattian, French, German, Russian), Immortal, Miscellaneous (Diplomatic Immunity), Omni-Connection, Scholar (History). Aram “The Other” Armstrong (High), Bloodshot (High), Ivar Anni-Padda (High), Neville Alcott (High). Enemy (Eternal Enemy), MIA (Obeying the Geomancer), Public Identity. Gauntlet [BODY 07, EV 03 (08 w/STR, 10 w/Martial Artist)]. Combat Knife (x2) [BODY 07, EV 03 (08 w/STR, 10 w/Martial Artist), R#0]. Retractible Whip [BODY 07, EV 03 (08 w/STR, 10 w/Martial Artist), Stretching: 02. Limitation: Stretching allows no fine manipulation (-2FC)]. 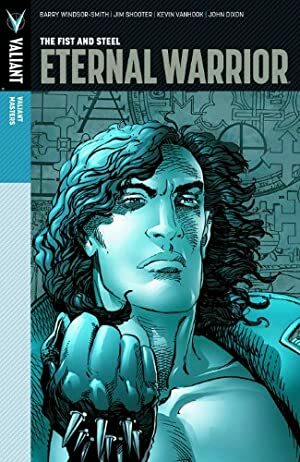 Source of Character: Valiant Comics Series – The Eternal Warrior, created by Jim Shooter (author) and John Dixon (illustrator). Helper(s): Dr. Peter S Piispanen, Sébastien Andrivet.